Jesus at his previous orphanage. The past 24 hours have been a whirlwind of both joy and heartache. In just a matter of hours, after sharing Baby Jesus’s story (in our last blog), we were able to find enough monthly commitments to bring Baby Jesus to his new home in our OVI Children’s Hospital! When I made the first visit to Baby Jesus’s orphanage, his directors were already prepared with his small, rugged suitcase packed. Following the suitcase, I watched them carry Baby Jesus in their arms across the compound and lay him on a mattress in a shaded area for me to meet him for the first time. I was immediately captivated by his smile. As I held him, I sensed an overwhelming connection knowing that God had chosen him for us. His tiny body was atrophied and his head covered in sores from spending extensive time in bed. His breathing was labored and his movements weak, but he had so much strength in his eyes. Baby Jesus was ready to fight for healing. As I toured the institution, burdened with empathy for what it must have been like for both Baby Jesus and the orphanage workers to attempt to manage his care with so little access basic health resources. His pants were stuffed with ripped bed sheets as a diaper, his bed deteriorating from years of wear, and he was forced to fully rely on other children to carry and feed him as there were no wheelchairs or personal caregivers to accommodate his pressing needs. So there we sat, in a small shaded room—much like a stable—where Baby Jesus’s caregivers were pleading for me to “make room in the inn”. My heart ached as I told them that we must first secure sponsorship for his care, as his needs would be high — requiring building renovations, new personal caregivers, and security of funding for his stay which could be up to twelve years. Although I had an absolute conviction that God would provide, my soul yearned to leave with him that day. Instead, I listened to the still, small voice telling me to wait and trust in my Father’s provision for this beautiful child. So here we are, less than 48 hours later, with this beautiful Christmas miracle to call our very own. We have a personal caregiver who adores Baby Jesus and is with him everyday from the time he wakes to the time he sleeps. Not only does she love her work, but she considers it to be an honor as she calls him “her child from God”. Baby Jesus has fallen in love with his new bedroom and has been exploring the hospital activity halls with his best friend Meeshak who came to help him acclimate the first night away from the orphanage. His orphanage directors are celebrating an answer to years of prayer that they could find “more” for Baby Jesus. The matron of the home raised her hands and worshiped God for the 25 minute drive from the orphanage to the hospital. In whole, I am overwhelmed with peace as I look at the provision we have already experienced in our first 5 days as a hospital. The miracle of Baby Jesus will forever inspire me to seek out the weakest of the weak and to trust in our Father’s perfect provision for His children. If you are touched by Jesus’s story, please reach out to us or be watching for upcoming blog posts as we have already accumulated numerous request for children like Baby Jesus who are in desperate need of your “Yes”. 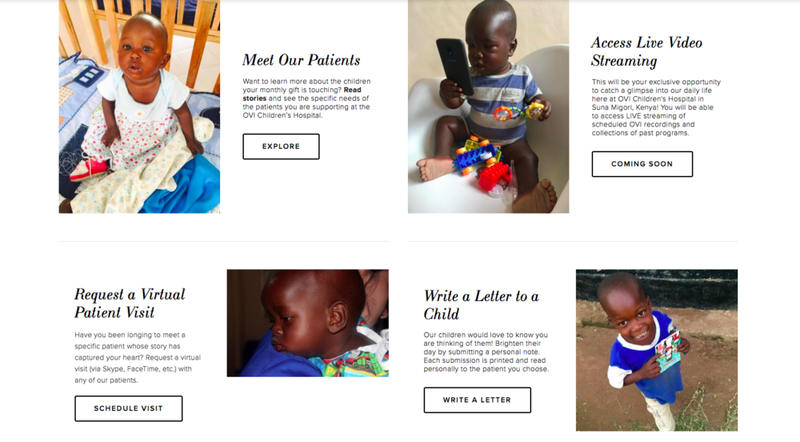 To become a patient sponsor, simply follow the link: ovinternational.org/donate & select “Give Monthly”. Your commitment will provide you with exclusive access to the patient sponsor portal which enables you to personally connect and learn exclusive stories about each patient you are supporting.